To vote constitutes an elemental right of the citizens of any functioning democracy, and acts dually as an entrusted responsibility of the officials that are elected. These officials are to vote on issues that we, as citizens, give them permission to represent our interests on. Last October 23rd, Tunisian citizens did just that: they held a fair and transparent election. It was held during the in-between hours of a dictatorship’s fallen dusk and a democracy’s glowing dawn. A new state, to be governed by the rule of law and most importantly, according to the will of the People, was to be ushered in through the Constituent Assembly elections and the reforms they are to undertake. A body of 217 representatives, coming from all walks of life, was inaugurated on November 22nd. There, in that assembly room in the Palace of Bardo, everyone is on equal ground. A vote is a vote. One person, one representative, one vote. The assembly even voted on (and passed) a very specific clause within the internal bylaws document that detailed this responsibility and its sacredness in the context of the assembly’s operations. Section 4, clause 94, says: “The vote is personal and cannot be done on anyone’s behalf or through any correspondence. A vote can be a vote of approval, rejection, or abstention. Starting on May 3rd, videos of our entrusted elected officials cheating and playing with their votes and the votes of others – committing electoral procedural fraud – in the Constituent Assembly started circulating on the internet. Two videos in particular were very quickly circulated on social networking sites such as Facebook and Twitter. The videos show assembly members Abdelmounem Krir (ex-Aridha) and Iyed Dahmani (PDP) voting “in the place” of other assembly members who were absent at the time of the vote. The videos caught the two members red handed. Further, there is no denying the credibility of the footages, which appear to be recorded on mobile phones or some other portable recording devices. Of course, we can give the two members the benefit of the doubt and believe them when they say “in the place” of other representatives (as opposed to simply using an absent member’s voting privilege to vote two, three times). But sparing the representatives the latter, the former – according to the internal bylaws that they themselves voted on – is equally damning. Voting on behalf of another representative is forbidden by the letter. The clear language used in §4.94 leaves no room for interpretation. To my surprise, however, the internal bylaws governing the Tunisian Constituent Assembly do not outline any measures that can be taken to sanction these transgressions. On May 3rd, the same day representatives Krir and Dahmani were recorded, I was actually at the Constituent Assembly. I began speaking with some assembly members about the general lack of vote traceability. On one vote the day before, the electoral voting system declared that 174 members voted – whereas only around 130 members were physically present* in the room. When recess came along, I headed down to the café below the general assembly’s meeting room, where I found many representatives taking a break. I spoke with the Constituent Assembly’s second vice-president, Arbi Abid, about the number that simply did not match up – and the strong doubts I had about the legitimacy of the vote. At first, he did not believe what I was telling him – he was shocked. I insisted that they cancel yesterday’s vote and repeat it by show of hands, since the electronic system, as of now, does not show which member votes how exactly. He promised that he would take the issue back to his bureau’s meeting that he rushed off to right after our conversation. The bureau consists of himself, the president of the assembly Mustafa Ben Jaafer, and first vice president Mehrzia Labidi, among other administrative members. In the meanwhile, I spoke with representatives Azed Badi, Slim Abdessalem, Nadia Chaabane, and others sitting nearby, about the same problem. Representative Chaabane has been one of the few assembly members who, using Twitter, first got the word out on these shameful practices. During a vote held the next day, similar doubts were raised by representatives Azed Badi (ex-CPR, now a member of the Democratic Independent Congress) and Sahbi Atig (Ennahda). In another vote the same day, Mustafa Ben Jaafer, president of the assembly, had the same doubts myself and many other Tunisian citizens had. He mandated that the vote in question be redone. Representative Ferjani Doghmane, however, who is the president of the finance committee, suggested that Ben Jaafer counts the number of representatives present by show of hands (so that the numbers of the original vote are preserved for reference). And indeed, the show of hands made it clear that some assembly members voted twice (or more) in the place of others that were absent. Some days later, representative Azed Badi started a petition that called for a deeper probe into the votes and greater transparency in the Constituent Assembly, including vote traceability. I have called representative Badi and asked for a copy of the petition – he has promised to send a copy my way along with the signatories as soon as he can. This article will be appropriately updated with a link to the petition. What is most alarming in this dilemma is the lack of any official response from the two members in question – you would think they would resign in shame upon the circulation of the videos. By sheer mathematics, they are certainly not the only ones to cheat during a vote. However, even the media did not do an adequate job covering the transgressions. The Tunisian national budget was passed through a series of invalid votes. The resources that the functioning of a whole society depend on are not being distributed according to the people’s will. The trust of the Tunisian voter has been betrayed. How are the media – and legal experts, watch group organizations, etc – not taking any official action to fight these shameful actions? Starting on May 5th, the OpenGovTN initiative began discussing a new campaign that will address 1. voting traceability in the assembly, and 2. the release of all committee meeting minutes. #7ell2 [#Open2] is the name – and so far, the group has been the only one to respond in a serious manner to the voting fraud. They have met with Mustafa Ben Jaafer and extracted a response from him: he promised to give in to both demands. The deadline is May 31st. If no official changes take place, the OpenGovTN group has threatened to seek legal action. I feel ashamed just writing about these transgressions. Still in a state of psychological shock, disappointment, bitterness – whatever it is – it pains me to write in plain English letters: several Constituent Assembly members are cheating with their votes and are not performing their lawfully entrusted duties. Each representative who cheats represents 1000s of Tunisians, and the trust of each one of those Tunisians has been violated in bad faith. It is through the practices such as these that the Tunisian people may never get to live the dawn of democracy. *The absenteeism that plagues the assembly is another topic that necessitates equal attention and diligent writing. to write (eloquently) in arabic. To properly write in Arabic (in a semi-eloquent way), I need to first forget all my English. My mind just keeps making parallels that simply do not exist. While it’s a commendable biologically initiated effort, it’s annoying, and in some ways – counterproductive. 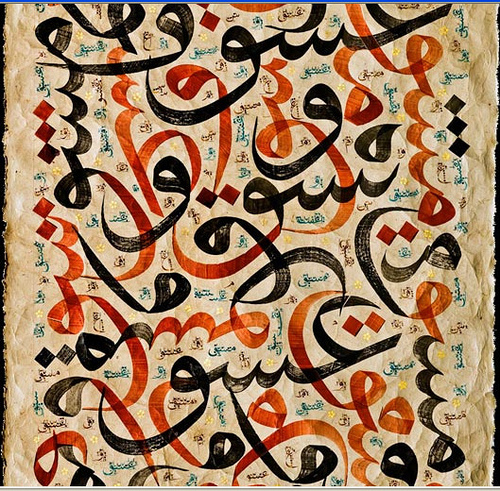 Arabic has its own world, with its exclusive ways of spoken, and especially, written eloquence. Time to temporarily forget English? Hm. I also just wish less people spoke English.